Make the most of your time in port with this 2-hour walking tour of Fremantle’s best bits. 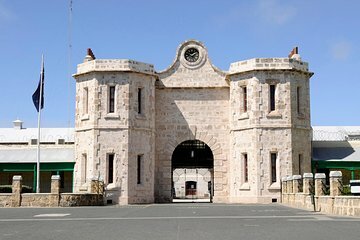 Discover the fascinating colonial history of the port town as you follow your guide to landmarks like the 19th-century Town Hall and the Roundhouse; tour the UNESCO-listed Fremantle Prison (own expense); and browse the shops and galleries along lively Cappuccino Strip. Best of all: this shore excursion is covered by Viator’s worry-free policy, guaranteeing on-time return to your ship. Once disembarking your ship, please take the complimentary City of Fremantle shuttle to the Fremantle Visitor Centre to join your walking tour. This is approximately a 10-minute trip. Fairly good tour. Ryan, a Canadian was our guide which was a bit weird. We saw a lot of the convict era buildings and were told many stories about some of the convicts. Most of the stories were too long as he told them as we stoodin the sun outside the old Police station, Fremantle gaol etc. Too long winded although he knew the history. I would have preferred more walking as there were many other places along the way to look at.